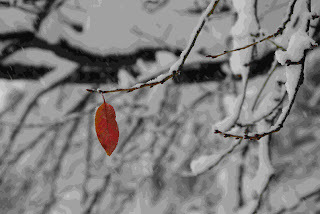 On Friday, we woke up to snow-covered streets and falling snow. The salt trucks hadn't completed their rounds but we had already planned on meeting some friends for a morning workout at the local Y. 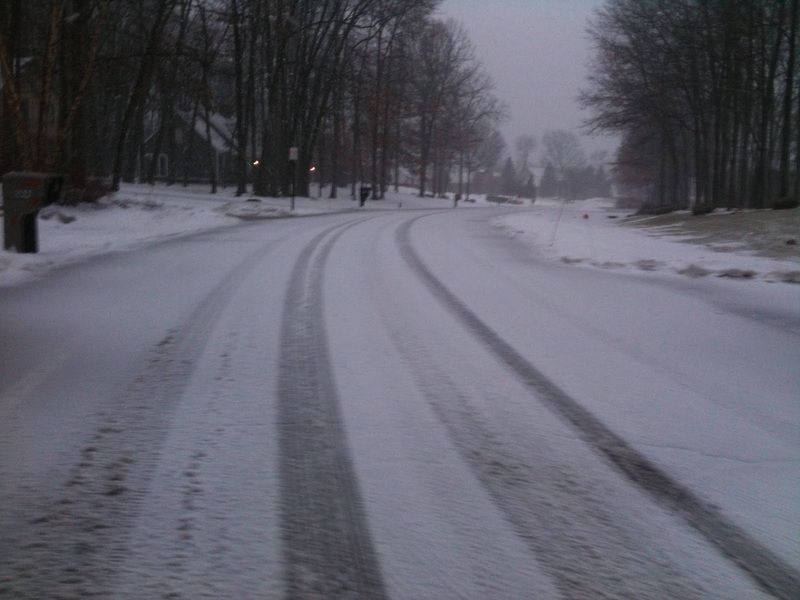 It was a perfect time for my student driver to get a feel for driving in the snow. It was a short drive, I told myself; we could do this. And we did. It was an uneventful round trip there and back. It would have been so much easier on me to just do the driving and just say, "Look, honey. This is how it is done." Of course, that is not what my teen needed. 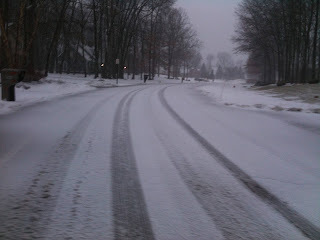 My teen needed to experience the drive, control the wheel, plan for herself, and adjust if she started to slide. My job was to sit in the passenger's seat and be ready to direct, guide, warn...and hang on for dear life. It is sort of symbolic of parenting, isn't it? Sometimes teens need us to take the wheel, and that is ok. There are times when I've had to tell my kids to figuratively pull over so I could drive for a bit and get them out of a mess. However, don't be too quick to take the wheel. Kids often just need us to be along for the ride (possibly holding our breath), ready to rescue them from a near collision. Sometimes I see danger barreling down the path, but I need to give my teens a chance to see and react first. Otherwise, I'll diminish the lessons that can be learned before they need to travel on their own. I've had other parents question some decisions I've made for our kids. Sometimes it involves safety concerns, such as allowing a child to fly alone to visit out-of-state friends. Other times, it may involve academic choices or social situations. Usually it isn't an outright judgement, but more of an "I'm not sure if I could allow my child to do that." It is about a parent's lack of comfort in letting their child make choices - to see and to react - on a path that isn't completely clear. It definitely isn't comfortable. Not at all. Here's the thing - I'd rather have my child navigate some of these slippery paths with me right there in the passenger's seat where I can direct, guide, and warn, rather than for the first time on a solo drive. Just like driving, life takes practice. You wouldn't send them to drive in a snow storm solo without a little guided practice first. Why do so with the path of life? After surviving our short jaunt to the Y on Friday, yesterday I decided my teen was going to take the wheel for our normally 45-minute trip home from choir. Because our drive home involves three major freeways during rush hour, she had never driven the route home. Yesterday, it also involved rain, sleet, and heavy snow as a storm blew through the area. 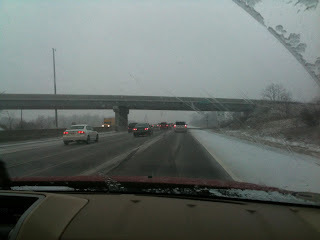 Having a little more life experience in wintery weather traffic conditions, I was much more nervous than my teen. Her earlier drive on Friday had given her a little confidence. Even so, she knew to still be on high alert. She was quite willing to take instruction, but really didn't need much. I tried to keep my mouth shut and she tried not to comment too many times when she saw my foot move toward the imaginary passenger's side brake. 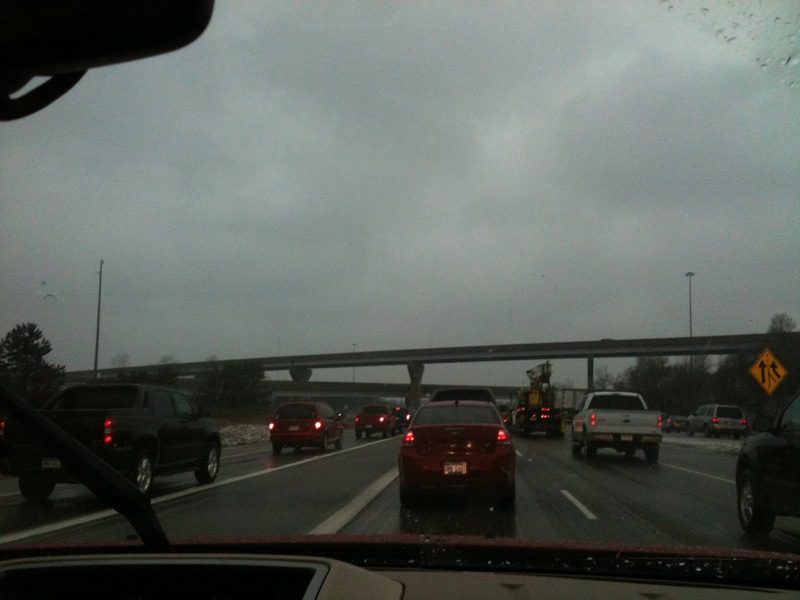 With traffic congested and moving slowly, it was a long ride. Despite my visions of ending up in the ditch like some fellow drivers, two hours later we made it to our neighborhood safely. Did I want to take the wheel and make the drive myself? Yes. Was it uncomfortable? Absolutely. But I now feel better knowing my daughter has managed a storm with me by her side. She'll know what to do if one unexpectedly comes in while she's driving alone. It isn't easy being in the passenger's seat, whether figuratively or literally. It can be terrifying. It takes courage - and prayers. But sometimes, you just need to let them drive. They say your blog should reflect you and be real. A friend often tells me I have an “all or nothing” personality. If that is the case, my blog definitely has been a reflection of the nothing part. It has been seriously neglected lately. In fact, it has been bordering abandoned. For a variety of reasons, I decided to get back on track. If you have an “all or nothing” personality, you know that a challenge in making changes is creating obtainable, yet satisfying, goals. I need to be careful to not go all grand plan and try in an effort to make myself an overnight sensation of the homeschooling Blogsphere. Baby steps. I must do this in baby steps. I also need to keep in mind, “If you fail to plan, you plan to fail,” which is a really old saying that is still around, so there must be something to it. When Mosaic Reviews asked that its team of reviewers check out a list of blog planners and select one for review, I sort of cringed - and possibly even twitched a little. While I know I need to plan, I quickly became overwhelmed with some of the really awesome and elaborate planners out there. They just didn't fit with my writing-when-inspired approach to blogging (a.k.a. flying by the seat of your pants and hope it works out). A simple blog planner is what I need. Check out this planner offered for FREE by Girl in The Woods. A whole month of planning is on *one* page. It gives you space to think about daily topics (weekends off!) with a side column to note tags, categories, and links. Up at the top is a short and simple reminder list for each post. Following this checklist would have saved me some past headaches! I’m not sure if I will be able come up with enough topics and inspiration for a daily blog post. I think I’ll commit to posting two or three times a week for starters. Perhaps I can use the other days spaces to plan for blog hopping, posting on my blog’s FB page, or some other non-posting activity. Also, if I think of a topic, but don’t have time for it at the moment, I can just jot it down for a future week, rather than trying to recall that great blog post I had thought of when I didn’t have time to write, but was sure I would remember. Some weeks I have tons of ideas and little time. Other weeks when I actually have time to write, I've got nothin'! This simple planner will help me organize my random thoughts and time into something that just may work. 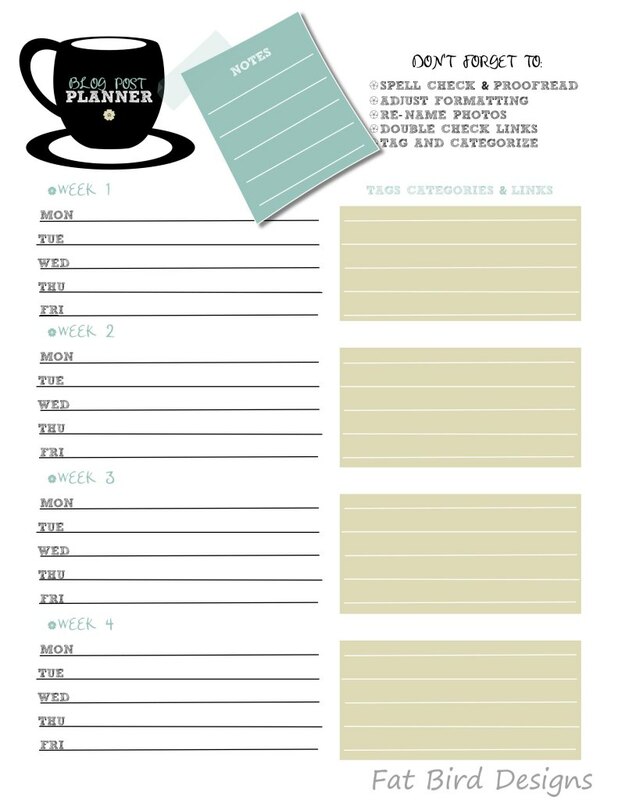 The simplicity of this planner, available as a free download, doesn't make me overwhelmed and feel like I have to fill in every blank or I'm a blogging failure. Thank you, Girl in The Woods, for the inspiration to get back on track. Hello, I'm Heidi. Nice to meet you! Ever feel like it has been so long since you talked to someone that you needed to reintroduce yourself? Now that we are reacquainted, you will see more posts happening here in the near future, both personal and product reviews. I stepped down from my review position with a homeschooling magazine for a variety of reasons. I started writing a monthly column with Homeschool Mosaics. If you haven't checked them out yet, you must. There is something for everyone. I've lost over 25 pounds! My kids starred in a zombie short film this summer. It was hilarious. I have a new reviewer position with Eclectic Homeschool Online. I'm doing yet more reviews with the new Mosaics Review Team. I am mom to a black belt. Our family went on our first real vacation in over five years. I've had a dabble of excitement, some new opportunities, and a whole new world of parenting challenges!